Fort Amanda (1812-1815) - First established in 1812, during the War of 1812, by Ltc. Robert Pogue, Kentucky Mounted Militia. Named after Ltc. Pogue's daugher Hannah Amanda Pogue. Abandoned in 1815. Fort amanda was quickly built in 1812 as a 160 by 160 foot square stockade with four, two story blockhouses, one at each corner. The fort was expanded in 1813 to become a key supply and debarkation point for troops heading north toward Detroit. During the expansion, a fifth blockhouse was added as well as several cabins and the stockade was built out to 160 by 320 feet. 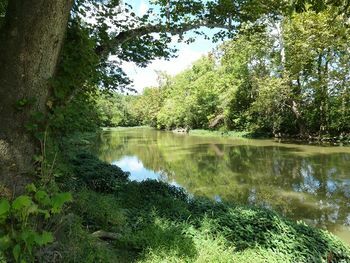 The fort was located on the west bank of the Auglaize River and served as a critical transportation hub. About 75 boats were built here to supply other posts along the chain. Thirteen forts were located within sixty miles of this post. At the end of the war, the fort was abandoned and occupied by settlers. 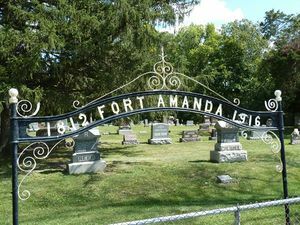 The nearby cemetery contains graves for 75 unidentified soldiers that died at Fort Amanda. The soldiers who died there were a combination of soldiers from the fort and those who were wounded in battle and died at the fort hospital. 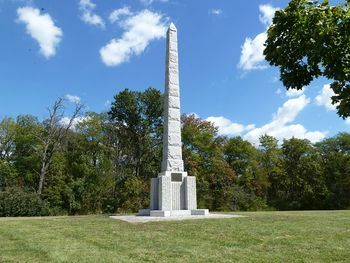 Part of Fort Amanda State Memorial. Includes a park, a memorial and a cemetery. No period guns or mounts in place. Location: Fort Amanda State Memorial, Auglaize County, Ohio. This page was last modified 20:36, 24 March 2019 by John Stanton.